Try out these beer pancakes with caramelized hazelnuts and a special maple syrup. Getting ready to celebrate St. Patrick's day? We came up with an awesome pancake recipe - it involves beer pancakes soaked in a homemade Guinness Maple Syrup, crunchy caramelized nuts and Irish whiskey cream, all layered in tall beer glasses. 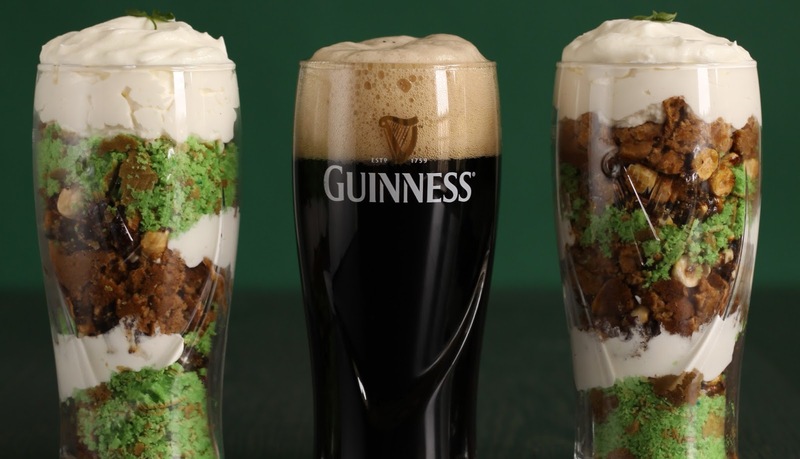 We are lucky - our friends at Irish Fiddler kindly lent us a couple of original Guinness glasses to make the dish look perfect. Put on your best green t-shirt, gather your leprechaun friends and start making the pancake pints (there is a rainbow at the bottom of the glass by the way)! Put your whipped cream in a tall bowl and mix it with a hand blender. When the whipped cream is only minutes away from firm perfection, add some nice Irish whiskey, one tablespoon at a time! Have a taste of it yourself, if you want them to taste lighter, just take less alcohol. In the end you can add the sugar to make it more sweet. Simply whisk maple syrup and beer in a small bowl. You will use this mixture after you're done with frying all the pancakes. Preheat your pan on a medium heat and roast the nuts without oil until they get brown; then start pouring sugar over them until it caramelizes. Be very careful - the sugar is very very very hot! Let them cool on a plate while you prepare the rest. Nuts that might be left over after arranging the pancakes are a perfect crunchy snack to go along with beer. Start with making the milk sour: grab a big bowl and pour 150 ml of milk into it. Add 2 teaspoons of apple vinegar; let it sit for 5 minutes. Then add one egg (not separated), the oil and the green food coloring. Grab one small bowl and put the dry ingredients (ﬂour, sugar, baking soda, baking powder and a pinch of salt) into it and stir a little. Now pour in the dry mix into the green milk mixture; blend lightly and let it sit in the fridge for 10 minutes. Seriously, there's something about green pancakes that just makes us lucky... how about you? Preheat the stove and pour in the batter (don't put any oil in the pan). Remember: there is no need to make perfectly round and beautiful pancakes this time - we crumble them for our further purposes anyway! While frying you might want to be careful, those green guys get brown quickly! For the ﬁrst step, take 50ml of regular milk and combine it with 2 teaspoons of apple vinegar in a bowl. This helps the milk get a little sour, which will make the pancakes super ﬂuffy although without using buttermilk buttermilk. Let it sit for 5-10 minutes. Add 1 egg (not separated) and 3 tablespoons of oil into the same bowl, stir. Now add 150ml of Guinness Extra Stout into the mix - we want those pancakes to taste like the best Irish beer, right? Put all the dry ingredients (ﬂour, sugar baking soda, baking powder and a pinch of salt) in a second bowl. Preheat the stove (don't use any oil in the pan) and start flipping the pancakes. As we are going to crumble them anyway, there's no need for you to make them perfect. When you're done with all the pancakes, whiskey cream and the Guinness maple syrup, it's time to arrange the dish. Crumble green pancakes in one bowl and brown pancakes in a separate bowl. Pour the Beer Maple Syrup over the brown pancakes. Give it a light stir. Now fill the pints with layers - green pancake layer, whiskey cream layer, crunchy nuts layer and then brown syrup soaked pancake layer. Make sure you add enough whiskey cream in between- and put more cream on top to give them the beer foam look! And you're already done - time to get drunk on pancakes! Happy St Patrick's day everyone!